Southern Oregon is home to some of the country's finest retirement facilities, and last month my parents and I toured one of the area's nicest and newest communities - Veranda Park in Medford, Oregon. I'd hoped to have a detailed account of our tour online by now but that didn't happen yet, so please stay tuned for a more detailed description of Veranda Park. 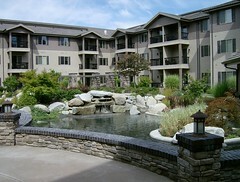 We'll also be featuring some other Oregon Retirement communities over the coming months.